When Oodle started out six years ago as a classifieds search engine, it’s focus was all around search and bringing together the best classified ads from all over the web. Today, it still does that, but increasingly it is moving more and more towards social classifieds. “We are 100 percent committed to social,” CEO Craig Donato tells me. Oodle already powers the Facebook Marketplace, perhaps the largest business app on the social network. Of the company’s 14 million total users a month, 6 million are on Facebook. And tonight it plans to roll out a slew of new social features. In addition to seeing what items for sale your friends are listing on Facebook, you can also see items from friends of friends, and from people who belong to the same networks. (Some of these group buying features come from its recent acquisition of Grouply). You can now also post items just to your friends, and you have the option to lend items or give them away. Donato recently posted that he was looking for a car for his foster daughter. A friend from grad school saw the request and just gave her his old car that he was going to try to sell. Every listing is tied to a real Facebook identity, and the listings pages are redesigned to better show who that person is and how you are connected. Email communications similarly will display summarized profile information and pictures of common friends. Oodle is facing increasing competition from younger startups such as Yardsellr to become the eBay of social, but with Facebook Marketplace Oodle has the scale to become the default for social classifieds. 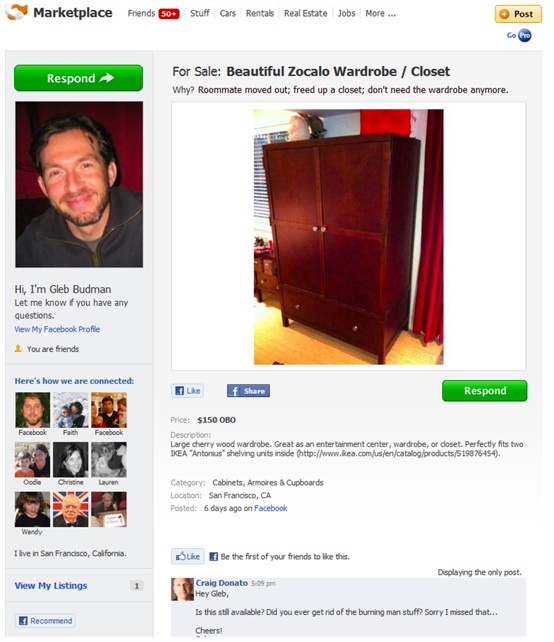 How does Oodle plan to make money off of social classifieds where there are no listing fees? Off of businesses, of course. 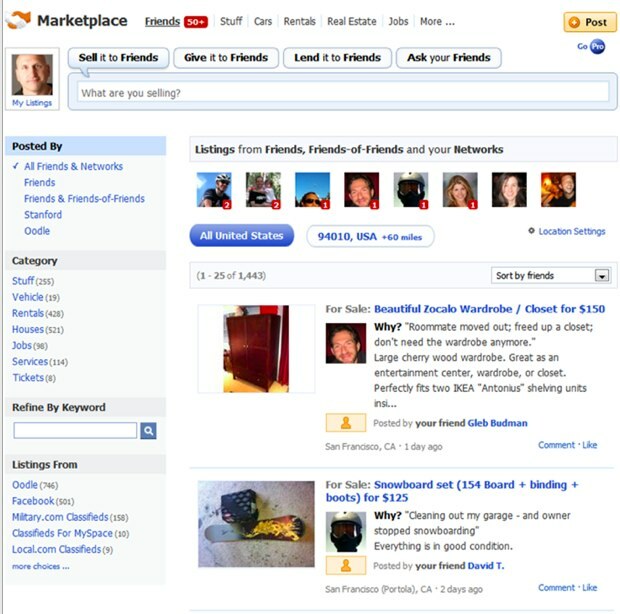 Oodle charges small businesses for premium services such as reporting and linking listings to their Facebook pages Whereas the Web and e-commerce has helped to “has really dehumanized local transactions,” Donato believes that social classifieds will help reverse that trend because they usually result in a face-to-face transaction where reputations matter more than on the web. He also believes that getting rid of anonymity helps to eliminate bad behavior such as scams or people simply not holding up their end of the bargain.